Now, I am adventurous and luckily I have dinner buddies that are too. We grabbed a few neighbors and made our way to the Pearl to check out this new gem. First off you need to know that if it’s really busy you can put your name on the list, give them a phone number and go elsewhere for a bit. And we did go grab a drink. Walking into this place you feel like you’ve entered the newest, hippest joint in town. I’m not kidding, they have done a great job on the inside. They have big tables that seat 8. If you are a party of 2, don’t be surprised if they seat you with another party. It’s a great way to meet people, and we did just that. I was most intrigued by the pizza topping options. Since it was such a big party, 6 of us, we ordered 4 pizzas. I love sampling, well and eating, and let’s not forget drinking beer. Anyways…pizza toppings. 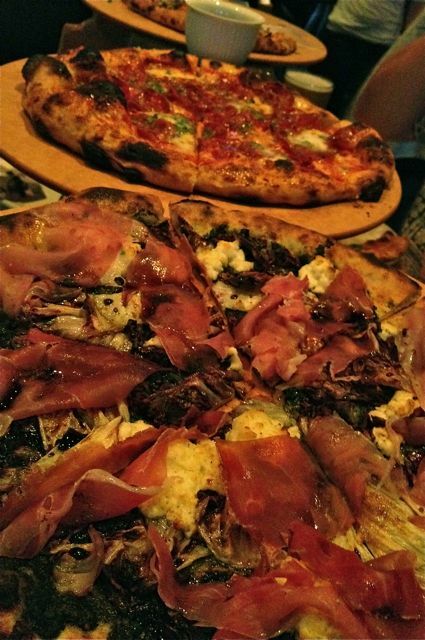 We ordered a broccoli pizza, Nettle pizza, salami and Wild Fennel Sausage. I honestly can’t tell you which one I liked best. The Nettle pizza was very good and I love the uniqueness of nettles. I just got introduced to them last year and loved ordering and sharing this pizza with the group. They all enjoyed it as well. The Salami pizza had honey drizzled across it. It was definitely a table favorite. The people sharing our table got that one with arguala added to the top. Kicking it up a notch, love it. The broccoli pizza was also very flavorful. You really need to like broccoli if you are going to order this pizza. The flavors were vibrant. The Wild Fennel Sausage was last on my list to try, but surprisingly very good. I guess I didn’t realize that it came with potatoes and smoked mozzarella. The combination was so perfect. 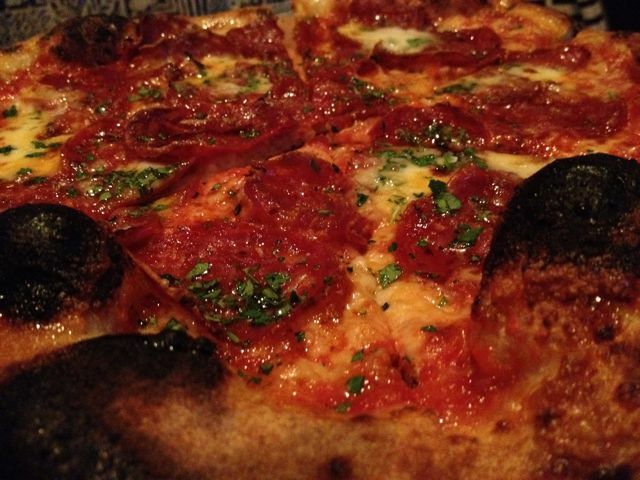 Every pizza has a very thin crust. I personally like that because you don’t feel like you’ve eaten a lot of bread. Instead you have enjoyed some creative and innovative toppings. We were bummed that the cauliflower crust pizza was gone, but it was only to make room for more seasonal fare. And you know me, I like to eat what is in season. Menus that are always changing is what keeps me coming back. You just never know what you might order. I was so excited I forgot to mention the appetizers we got. We tried the Rosemary Bar Nuts and Fried Chickpeas. The bar nuts were not overly strong on the Rosemary. I would know, I don’t like that herb, but I had my fair share. I love, love, love Chickpeas, so I thought the fried chickpeas were the bomb! We will be back as Oven & Shaker has made my favorites list. Train Wreck from Oven and Shaker. Great drink by the way. Atmosphere was off the charts trendy, cozy and fun.There was definitely a buzz about this place. Service was great. They were helpful when we were ordering and they kept our water pitchers full and they checked on us often. Pricing was good. 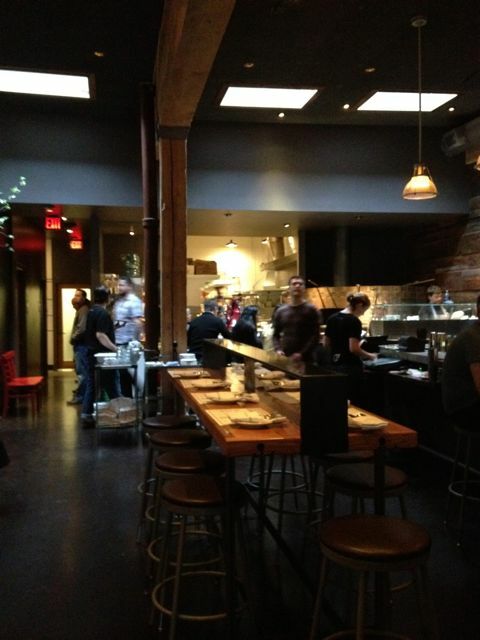 This is a trendy Pearl spot, so be prepared to spend a little more on this pizza. Drinks were on the high side, but the beer was priced well. The bar was well stocked, they had great beer choices, not a lot, but good choices nonetheless. I saw a wine list, but didn’t check it out too closely. 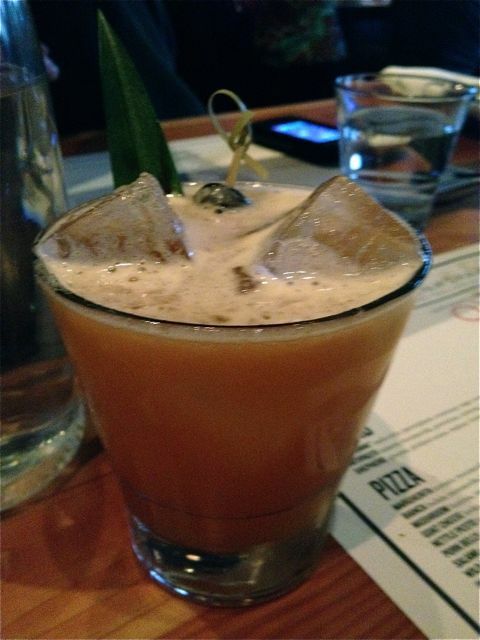 One friend ordered a drink from their specialty list and it was very good.